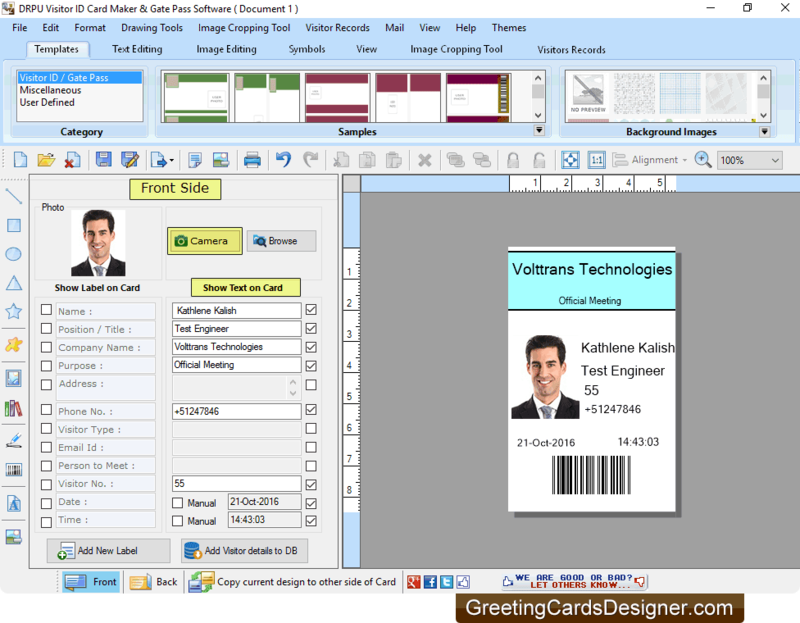 Create customized visitor ID cards and Gate Pass using Visitor ID Card Designer Software. Using Gate Pass Maker and Records Management tool, you can easily maintain all visitor's details by saving them to the database. During ID Card Designing process, you can add photo to your ID card by taking picture of visitor using Camera Settings. Software provides option to copy current visitor ID card design to the other side of the card. With the help of inbuilt Email Setting feature, you can send designed ID cards to single or multiple email IDs. Facility to save visitor's details to the database. Software provides option to export visitors record in excel file. Software has option to export designed visitor ID card in PNG, JPEG, PDF, BMP and other file formats. Software provides Image Cropping tool to crop single or multiple images for visitor ID card. Provides option to print designed ID cards using print settings. Option to save created visitor ID cards log for future reference.